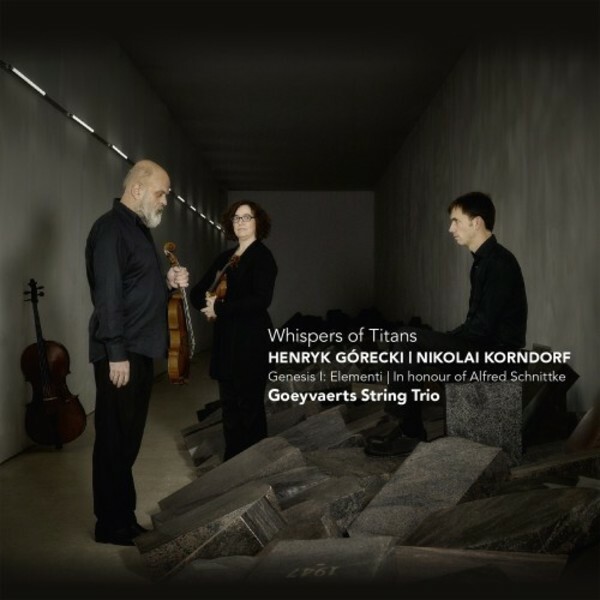 The Goeyvaerts Trio - which specialises in Eastern Europe music of the past and present centuries - pairs two fascinating string trios on �Whispers of Titans�, Gorecki�s rarely performed Elementi and the 1986 trio by Korndorf. Medieval, Romantic, minimalist, avant-garde - all find a place in the music of the Russian/Canadian composer Nikolai Korndorf (1947-2001). Yet his work rarely sounds eclectic, the ideas and techniques combining to form a focused, and often uncompromising, musical language. From the early 1980s tonality became an important element of Korndorf�s music. His String Trio, completed in 1986, was written in homage to Alfred Schnittke. Like the Korndorf Trio, G�recki�s Elementi is music of extremes. A bold, physical aspect defines both works, with the sheer energy of the performance an integral part of the listening experience. Elementi dates from 1962, early in the Polish composer�s career, and demonstrates the increasing sophistication with which he was then handling modernist techniques. The Goeyvaerts String Trio, founded in 1997, takes its name from the Flemish composer Karel Goeyvaerts (1923-1993) who played a key role in the fundamental changes in European new music. In its performances the trio aims for authenticity, seeking out the advice of such eminent composers and musicians as Alexander Ivashkin, Giya Kancheli, Henk Guittart, Sofia Gubaidulina, Alexander Knaifel and Arvo P�rt. For Challenge Classics, the trio has also recorded �String Trios from the East�, a double album of works by Gubaidulina, Kancheli, Knaifel and Oleg Paiberdin (CC72503), and �String Trios� by Webern, Schoenberg, and Schnittke (CC72375).